The 1950s and ’60s were a time of soaring, unprecedented technological change in America. But wow, gasoline must have been crummy then. We have an enduring nostalgia for gas stations. When the car culture took off in a major way following World War II, as suburbs sprouted up and newly paved interstates beckoned, “filling stations” — staffed by helpful, smiling, uniformed attendants — crystalized of this portrait of a wide-open America. It’s road-trip time, America. Even if life, liberty and the pursuit of acceleration aren’t specifically outlined in the Constitution or its 27 amendments, the freedom to drive wherever we want, whenever we want, is deeply ingrained into the national identity. Some 42 million people plan on traveling at least 50 miles during the holiday weekend, the most since 2007, according to AAA. They’ll enjoy gasoline prices that are at their lowest in years: The national average for a gallon of regular 87-octane gas stood at $2.767 Thursday, 90 cents cheaper than a year ago. At Fuel Freedom, we believe the best way to drive prices even lower and keep them that way is to introduce fuel choice at the pump. Alcohol fuels like ethanol and methanol are cheaper and cleaner, saving consumers money, cut air-pollution levels and reduce our dependence on oil, one-third of which is imported. But even if you care about none of those things, there’s this: Ethanol rocks. It pops. It cranks. E85 blend, which is up to 85 percent ethanol and the rest gasoline, increases power and performance in engines, largely because more of the fuel’s energy content is used up when it burns. Because of the high oxygenation of ethanol, the pure form of the alcohol has an octane of 113. 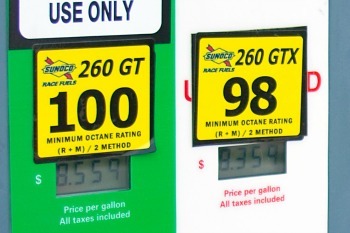 E85, whose ethanol content can vary depending on the season, usually has a rating of 105. In fact, blending ethanol into the nation’s gasoline supply to make E10 is how oil refineries are able to bring the octane of their products up from weak tea to 87, 89 and 91. It also helps clean fuel systems, which is how oil companies were able to get harmful additives (benzene, toluene and xylenes) out of gasoline without sacrificing performance. So happy 239th birthday, America. It’s a perfect time to declare your independence from oil addiction. Go big, go ethanol, and go forth.